In the VETgirl online veterinary CE webinar, Dr. Sally Ryan will examine the following questions related to mentorship in the veterinary workplace: What is a mentor? What are the benefits of mentorship? Who should and should not be mentors? What are the qualities and responsibilities of effective mentors? What are the responsibilities of the mentee? What are the barriers to effective mentorship? 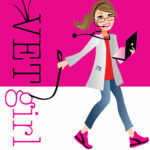 And how can leaders encourage effective mentoring relationships in the veterinary workplace? We all need support, guidance and encouragement when we begin our careers in veterinary medicine and as we learn new information and skills. Mentors and coaches are instrumental in leading this process and are essential to organization and practice success. I am interested in joining this CE class live on Thursday. How do I join the webinar? Do I need to register ahead of time? I am an Elite member. I attended this and it did not show up on my dashboard for CE..I just did the quiz to get it to show…should it show without doing the quiz though?